Jesus-Islam » The Christian life » What is a Christian? We know that many people wear the title of ‘Christian’, but do not follow Jesus. For them, the motivation is purely social or cultural. What are the beliefs of these people who are no more than nominal Christians? What are the foundations of the true Christian faith? What is the basis for the person who has come to a dynamic and intimate relationship with God? What is the spiritual DNA of the Christian? 1 – The true Christian recognises his sinfulness. The Bible says that the heart of the problem is the problem of our heart. The root of the problem is our bad heart. Every evil actions come from that evil nature, that evil heart. We have already seen what sin is and what it means to be a sinner. Just as a dog is not a dog because it barks, but it barks because it is a dog, so we are not sinners because we sin, but we sin because we are sinners. It is not our evil deeds that make us sinners, but we do evil deeds because sin is part of our human nature. Christians are the ones who have acknowledged this. There was a time when they did not want to admit it. There was also a time when it did not bother them. Now it has become a real concern. If we do not admit that we are all sinners and sinners, if we do not take sin seriously, we will never become Christians. Realising it is a first step. Why do we not take sin seriously? It is because we do not take God seriously. We see him as a policeman whom we can somehow dupe and so we imagine that we can escape our iniquity. Let’s take this example: A bus is driven at excessive speed on a seaside excursion. The driver chats with those who sit at the front of the coach. He shows them points of interest on the way. A little later, vehicles approaching him begin to flash their lights at him. He knows what it means: a Police speed trap is not very far ahead. He slows down. The passengers soon see a police officer by the side of the road with a radar gun in his hand. The bus passes it without problem. 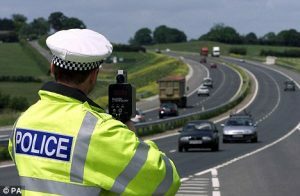 Immediately they pass the speed trap, the driver accelerates and begins signalling with his lights to oncoming vehicles. Few offences will be recorded that day by the police. The drivers kept the rules, but only when they thought they would be caught. However, in this way they showed contempt for the law and the Police, who represented the Law. Yet, here is one Lawmaker and one witness to our lawbreaking who it is not so easy to deceive! God’s law can be broken a thousand times and we think we will escape unpunished. 2. The Christian knows that he can do nothing to solve the problem of his own sin. To do his best, to do good works, etc., these are remedies of man-made religion. A true Christian may have tried them all at one time or another of his existence and found them useless to fight against his sinful nature. It is true that criminals can repent and renounce their old lives. In other words, they repent for some of their sins, but they remain sinners. Instead of being sinners who break the law, they become sinners who abide by the law. Their nature remains unchanged. In the first part of the Bible (the Old Testament), God asks us a question that arouses reflection: “Can an Ethiopian change his skin, and a leopard his spots? (The Bible, Jeremiah 13:23) The answer is no! It is the same with the man who seeks to change his sinful nature. No Christian has been able to accept this truth quickly and easily. It goes against human pride, but again it is an essential step to becoming a Christian. There is a third stage in the understanding a true Christian has. 3. A Christian believes that there is only one remedy for the problem of sin. This is the answer God has given us. A Christian is a sinner who has been saved by the grace of God from the consequences and power of sin. There are no other ways. It impossible to ignore the conditions of God. Seven years ago, I was in the boarding room of one of London’s airports. Sitting not far from me (leaving for Australia), a young woman seemed obviously in distress. The airline staff kept coming back and forth to her. They asked her some questions that seemed to increase her stress. Finally she was taken away. Apparently she had a valid passport but did not have an entry visa for Australia. She knew full well that the visa was essential, but for some unknown reason she chose to ignore it. On the day of the take-off, she was not allowed to board. She was from a country that needed a visa to enter Australia. Similarly, God demands that the problem of our sin be resolved if we want to enter heaven. God provides the remedy, but only in Jesus Christ. Ignore that, and like this young woman at London Airport, there will be no hope for you. At a youth meeting, some boys were discussing a serious discussion about the worst way to die. They compiled a list of the most painful deaths: being eaten by a crocodile, crushed by a roller, burnt alive … The list was long and horrible. When the pastor came in, they asked him for his opinion. He answered that the worst way to die was to die in your sins. In the biblical verse I just quoted (John 3:16), Jesus said that if we want to avoid the wrath of God and obtain eternal life, we must believe in Him as our Saviour. Believing means more than recognizing the authenticity of certain facts. It means acting in harmony with what we believe in. If we believe that we are sinners, left to ourselves we can do nothing against sin, but God has done all that is necessary, we will act according to our belief, repent of sin and go to Jesus forgiveness. When God saves a guilty sinner, he forgives all his past, present and future sins; Above all, he adopts him in his family. He makes him a co-heir with Jesus Christ of all the riches of heaven. He becomes his heavenly Father and thanks to this adoption, the repentant sinner can call him Father. It is a glorious salvation that we have in Jesus Christ!